My Vintage Granny Square design has to be one of my all time fave designs and I am still enjoying making them into a blanket. 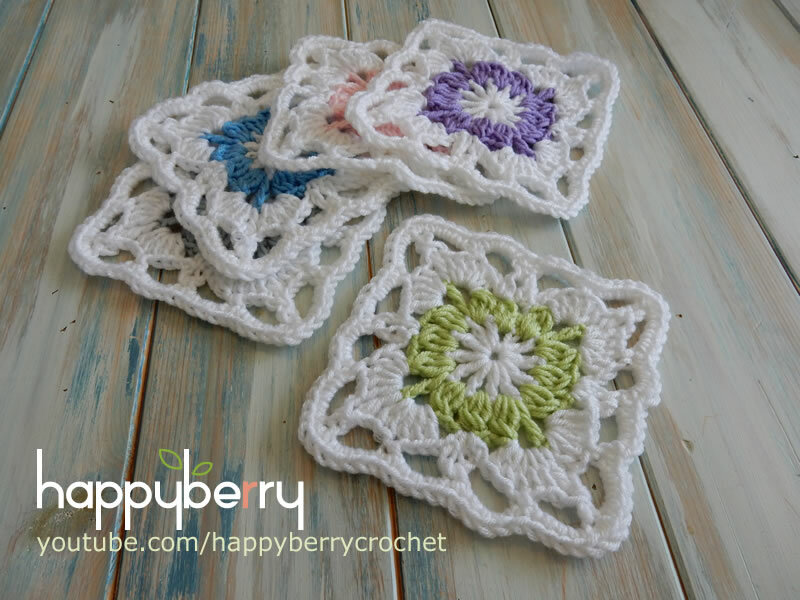 You can watch a video tutorial on how to make this square below, as well as a video tutorial on how I decided to join them together. HappyBerry Baby Snuggles yarn in various colours - this yarn is available on my website here: http://www.happyberry.co.uk for a very limited time only (until September 2015!) but you can use any DK/Light Worsted weight yarn you like, (yarn weight of 3). Yarn over for normal dc, hook through, yarn over and pull through, yarn over and pull through 2 loops, yarn over, hook through same space, yarn over and pull through, yarn over and pull through 2 loops, yarn over, hook through same space, yarn over and pull through, yarn over and pull through 2 loops, yarn over and pull through all remaining loops. Using white yarn (if following design above) ch4, sl st in first ch to form a loop, ch4, *crochet 1dc into centre of 4ch loop, ch1* repeat from * to * another 10 times, sl st in ch3 of 4 with second colour to join. Ch1, *3dc cluster (see notes above on cluster) in next 1ch sp, ch2, 3dc cluster in next 1ch sp, ch2, 1tr in top of next st, ch2, 3dc cluster in next 1ch sp, ch2* repeat from * to * another 3 times, sl st in top of first cluster with white yarn to join. Ch1, 1sc in same st as previous sl st, ch5, sl st in same st again, ch2, 5dc in next 2ch sp, ch1, 1tr in top of previous tr, ch3, sl st in tr st below, ch1, 5dc in next 2ch sp, ch2, *1sc in centre of next 3dc cluster (the middle one), ch5, sl st in same st again, ch2, 5dc in next 2ch sp, ch1, 1tr in top of previous tr, ch3, sl st in tr st below, ch1, 5dc in next 2ch sp, ch2* repeat from * to * twice more, sl st in first sc to join. 1sl st in first 3 chs of previous ch5 loop to top, *1sc in 5ch loop, ch4, sk4 sts, 1sc in next st, ch4, 1sc in next 3ch loop, ch4, sk3 sts, 1sc in next st, ch4* repeat from * to * another 3 times, sl st in first sc to join. Ch1, 1sc in previous sl st, 4sc in next 4ch sp, 1sc in next st, 4sc in next 4ch sp, 3sc in next st (on corner), 4sc in next 4ch sp, 1sc in next st, 4sc in next 4ch sp, *1sc in next st, 4sc in next 4ch sp, 1sc in next st, 4sc in next 4ch sp, 3sc in next st (on corner), 4sc in next 4ch sp, 1sc in next st, 4sc in next 4ch sp,* repeat from * to * twice more, sl st in first sc to join. Lovely pattern..... But you mention in the written pattern - row 2, to refer to "notes above" regarding 3dc cluster, it does no seem to be there. Thanks so much. I always look forward to your blog and your very generous free patterns. Wonderful pattern and Easy-to-follow video! Thank you! In your video, round 3, you said need to skip the next 2ch sp after the ch2, then straight to the other 2ch sp to put in 5dc. But in your pattern, you didn't mentioned about this. Did you miss it or I just misunderstood the written pattern? Do you have a link to print this pattern? Laura I really enjoy your tutorials on YouTube. They are so easy to follow. I made a bunny by your tutorial of r my granddaughter and now my cousins want one. Thank you for you instruction. Have a blessed week! Beautiful! I so want to do this. Thank you. thank you for showing the square, it is really great to do. thank you again.